In GOP Primary Race, Can Steadiness Trump Passion? For almost a year, Mitt Romney has tried to portray himself as the grown-up in the Republican race for the presidential nomination. Now, over the course of two debates and countless Florida campaign stops, the buttoned-up businessman is showing that he can get tough, too. Former Massachusetts Gov. 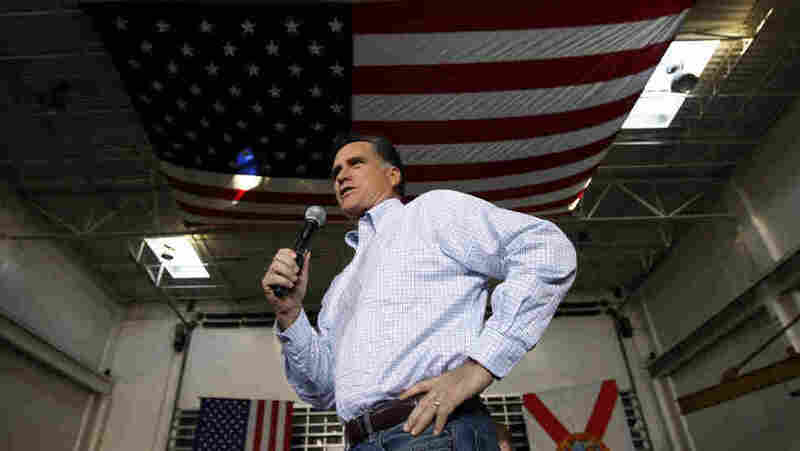 Mitt Romney campaigns at Ring Power Lift Trucks in Jacksonville, Fla., on Monday. Polls show him widening his lead in Florida after adopting a more aggressive campaign style. Mitt Romney starts the week having undergone a transformation. For almost a year, he tried to portray himself as the grown-up in the Republican race for the presidential nomination. Now, over the course of two debates and countless Florida campaign stops, the buttoned-up businessman is showing that he can get tough. This shift has upended the yin-yang dynamic that has been playing out for weeks between the passionate, fiery Newt Gingrich and the staid, steady Romney. On this eve of the Florida primary, it appears that the new Mitt Romney seems to be winning over many more voters than the old one. Consider the following quotes from people interviewed along the campaign trail. Then guess whether they come from a Gingrich or a Romney supporter. "I think somebody whose main vice is a Diet Coke as the leader of this country is a very interesting concept," said Christopher Miller at a rally in Jacksonville, Fla. If you guessed Miller is a Romney supporter, you are correct. Next, consider Cliff McKilley, who attended a rally with a buddy who wore a "fed up" T-shirt. "All of 'em have good qualifications and are capable, but I just step right back there [and see], who's got the fire, who's got the tenacity," explains McKilley. If you guessed Gingrich supporter, you are correct again. We found him at a "Veterans for Newt" rally in Jacksonville. In Orlando, we found legal researcher Elizabeth Item. "I don't think he'd control himself very well if he became president," said Item. She's describing her fears about Gingrich. She's a Romney backer. At a rally in Sarasota, one of the warm-up speakers asked if the crowd was ready to send President Obama back to Chicago. The crowd had someplace else in mind. "Kenya! Kenya! Kenya!" they shouted referring to the birthplace of Obama's father, while they waited for their man, Gingrich. President Obama, an American citizen born in the United States, released his long-form birth certificate last year after some questioned his birthplace. But those Gingrich supporters reflect the tone and emotional pitch that the candidates themselves have been projecting through the race. The Romney camp likes to portray Gingrich as unstable, calling his campaign "highly erratic," while describing the former Massachusetts governor as a vetted leader. Gingrich, meanwhile, attacks Romney as an establishment elitist and brags about his own history of shaking up the status quo. "I frankly don't care what the Washington establishment thinks of me, because I intend to change them," said Gingrich. Mitt Romney joins a list of presidential candidates who initially received a lukewarm reception from primary voters. Some went on to win their party's nomination. And a select few made it to the White House. Walter Mondale: After serving as Jimmy Carter's vice president, Mondale ran for the 1984 Democratic presidential nomination. While Mondale was considered the front-runner, he faced tough opposition from Sen. Gary Hart. Hart won New Hampshire and stayed in the primary race through the party's convention running as "the candidate with new ideas." Mondale was ultimately defeated by incumbent President Reagan, who won a second term. John Kerry: The Massachusetts senator entered the presidential race in 2003 as the presumed Democratic front-runner. Yet he faced a tough primary race against the passionate insurgent Howard Dean. Like Romney, Kerry was forced to challenge criticism that he was a wealthy Massachusetts lawmaker out of touch with many voters. In the general election, Kerry lost to George W. Bush in 2004. George H.W. Bush and Michael Dukakis: Bush entered the GOP primary race with front-runner status after serving as Reagan's vice president. Although he went on to become the Republican party's nominee during the 1988 presidential campaign, he suffered an early loss, ranking third in the Iowa caucuses. During the general election, Bush defeated Michael Dukakis, a Democrat and Massachusetts governor. The candidates offered voters two pragmatic choices. Dukakis was labeled a "clerk" and "technocrat." This primary season, conservative columnist George Will compared Romney to Dukakis. In December, Bush endorsed Romney, describing him as "mature and reasonable — not a bomb thrower." University of Central Florida political scientist Aubrey Jewett says a lot of Republicans get excited about Gingrich's bare-knuckle approach, especially this year. "There's a certain segment that's in the Republican base that still really, really wants someone that's just a fire breather to call Obama out on everything that he's done while in office. And they also quite frankly want someone that can match the excitement Obama seemed to bring into his election last time," said Jewett. Like the straight-A student who wishes he were the quarterback, the Romney campaign has envied Gingrich's ability to work an audience into a lather. And it's not just Gingrich. Michele Bachmann, Herman Cain and other candidates had the same talent. Gingrich just happens to be the most formidable challenger left. Still, Jewett says Romney has done well enough because voters also like a straight-A student. "Ideally, Republicans would like a candidate that would take sort of both those traits," said Jewett. And that's what Romney has been trying to deliver in Florida this past week. His relentless attacks against Gingrich suggest an act of political jujitsu redirecting Gingrich's strength — his anger — back against the former House speaker. It even plays out on specific issues, such as investments in Fannie Mae and Freddie Mac, the government-backed mortgage lender that was the subject of intense accusations between Gingrich and Romney last week. In one of last week's debates, when Gingrich attacked Romney for holding investments in Fannie Mae and Freddie Mac, Romney responded saying, "But, have you checked your own investments? You also have investments through mutual funds that also invest in Fannie Mae and Freddie Mac." The debate audience responded with a resounding cheer. And on the eve of the Florida primary, the tougher strategy seems to be working. Romney has risen in the polls dramatically. That may have something to do with the millions of dollars that his campaign has dumped into statewide advertising. But it could also reflect this change — that after a year campaigning as the grown-up in the race, Romney is telling voters that they don't have to choose between anger and stability, that the former Massachusetts governor can throw a punch too.